In the womb, fetal intestines develop outside of the abdomen for a brief time. 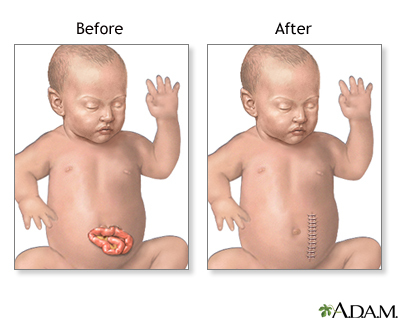 Normally, the intestines return to the abdominal cavity and the abdomen is closed at birth. 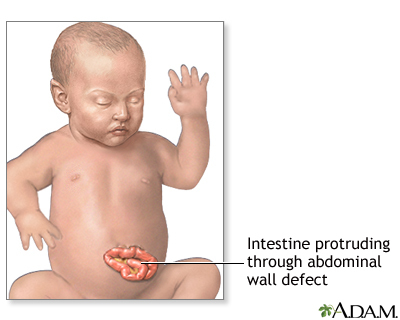 Gastroschisis is an abdominal wall defect to the side of the umbilical cord (umbilicus). 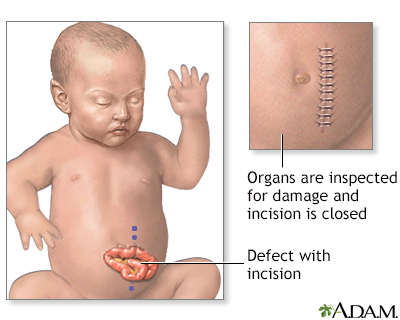 The infant is born with intestines protruding through the defect and no protective sac is present. Gastroschisis is rarely associated with other birth defects. Gastroschisis is a life-threatening event requiring immediate intervention. Surgical repair of abdominal wall defects involves replacing the abdominal organs back into the abdomen through the abdominal wall defect, repairing the defect if possible, or creating a sterile pouch to protect the intestines while they are gradually pushed back into the abdomen. Immediately after delivery, the exposed organs are covered with warm, moist, sterile dressings. A tube is inserted into the stomach (nasogastric tube, also called NG tube) to keep the stomach empty and to prevent choking on or breathing in of stomach contents into the lungs. While the infant is deep asleep and pain-free (under general anesthesia) an incision is made to enlarge the hole in the abdominal wall. The intestines are examined closely for signs of damage or additional birth defects. Damaged or defective portions are removed and the healthy edges stitched together. A tube is inserted into the stomach and out through the skin. The organs are replaced into the abdominal cavity and the incision closed, if possible. If the abdominal cavity is too small or the protruding organs are too swollen to allow the skin to be closed, a pouch will be made from a sheet of plastic to cover and protect the organs. Complete closure may be done over a few weeks. Surgery may be necessary to repair the abdominal muscles at a later time. 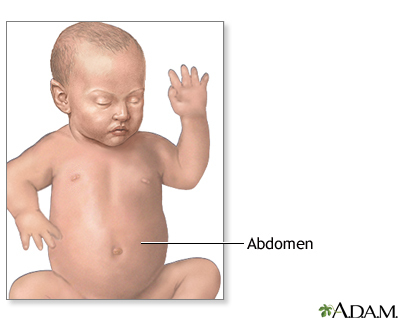 The infant's abdomen may be smaller than normal. Placing the abdominal organs into the abdomen increases the pressure within the abdominal cavity and can cause breathing difficulties. The infant may require the use of a breathing tube and machine (ventilator) for a few days or weeks until the swelling of the abdominal organs has decreased and the size of the abdomen has increased. The defect can be corrected with surgery in most cases. The outcome depends on the amount of damage to or loss of intestine. The infant is cared for post-operatively in a neonatal intensive care unit. The baby is placed in an isolette (incubator) to keep warm and prevent infection. The baby will be given oxygen and often require mechanical ventilation. Intravenous fluids and antibiotics and pain medication will be given. A nasogastric tube will be in place to keep the stomach emptied of gastric secretions. Feedings are started by nasogastric tube as soon as bowel function resumes. Feedings are started very slowly and often infants are reluctant to feed. These babies may need feeding therapy and lots of encouragement.